Made in USA Steampunk Jewelry Made a great gift! Wife of Mr. MadeinUSAblog here. Having now fully caught the buy Made in USA bug too, I was faced with the dilemma of what to get my main man for his anniversary. I went to my go-to website for gifts that are original and (mostly) Made in the USA, Etsy.com. On Etsy, I found EDM Designs, an amazing jewelry designer who hand makes steampunk fashion jewelry (my husband’s latest interest). EDM designs features re-purposed styles of fine watch pieces from the mid to late 1800’s and into the early 1940’s. The result is a stunning line of cufflinks, necklaces, pocket watches and more that are sure to be a conversation piece for anyone who wears one. 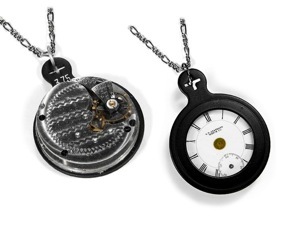 I chose the Reversible Pocket Watch Vintage Optical Lens necklace, recently photographed on Howie Mandel (although Howie had no bearing on my selection, I just really liked this one). The search for an original, quality Made in USA gift was a success! 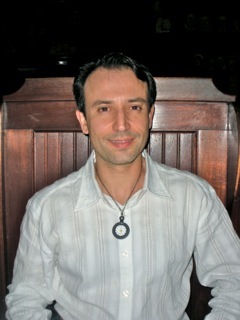 My husband loved the necklace. I loved the personal communication I got from the seller and supporting an American artisan who is obviously very talented. You will find designs and jewelry pieces that touch the spirit of those with an appreciation for the lifestyle and old world adornments of the vintage eras. Influenced by my utmost respect for the brilliant and skilled craftmanship of vintage watch movements, master artisans of yesteryear hand created these intricate and fascinating little worlds of synchronicity and artistic beauty. To be able to repurpose them and allow these mini landscapes of art find new life in today’s times gives me tremendous pleasure. I work hard to ensure the visual integrity of the vintage pieces being used. In many cases, such as many of our cufflinks, rings and necklaces, etc., our products are professionally soldered for pieces that are of the highest quality…. resulting in a finished product that is both hand made and visually stunning. Check out all of the incredible, original creations of EDM designs, found on her Etsy shop here.